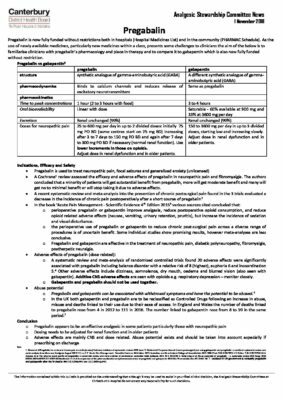 Pregabalin is a gabapentinoid that is now fully funded and indicated as an option for patients with neuropathic pain, as well as focal seizures and generalised anxiety (unlicensed). Pregabalin may offer advantages over gabapentin in patients where adherence to a three-times-daily regimen is problematic or where gastrointestinal absorption may be impaired. The efficacy of gabapentinoids should be reviewed after initiation and dose escalations, as many patients obtain minimal benefit but experience adverse effects. Gabapentinoids also have the potential to be abused. For more information, see the bulletin published by the CDHB Analgesic Stewardship Committee on our website.